Patients who are suffering from oral discomfort or who have difficulty eating or speaking due to the presence of a frenum can undergo a simple procedure called a frenectomy to address these issues. 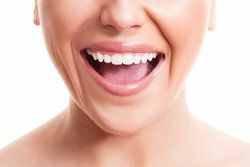 A frenectomy reduces or eliminates the frenum, which is a muscular attachment that connects your gums to your upper teeth and your tongue to the floor of your mouth. At Oral Surgical Associates in Missoula, MT, Dr. Armando Gama and Dr. Eugene Morris can perform a frenectomy on both young children and adults to correct a variety of cosmetic of functional issues. There are two frenum in your mouth: the labial frenum, which connects the inside of the upper lip to the gums; and the lingual frenum, which connects the tongue to the bottom of your mouth. The labial frenum can cause oral discomfort if its presence causes the gums around it to recede. Additionally, the labial frenum can create a large gap between the front teeth that can often not be corrected by braces or other cosmetic treatments. Patients who are receiving dentures or other oral appliances may need to undergo a labial frenectomy to ensure a proper fit for their prosthetic. The lingual frenum can cause speech problems and restrict a patient’s ability to eat properly. A “tongue tie” can occur in infants who are born with a lingual frenum that extends to the tip of the tongue. Tongue tied infants may have trouble breastfeeding, which can result in low weight, fussiness, gagging, and vomiting. If you or your child are suffering from the effects of an overextended frenum, our oral surgeons can perform a simple procedure to reduce or eliminate the tissue to restore proper oral function. During a consultation at our office, Drs. Gama and Morris will perform an examination to determine whether a frenectomy can benefit you or your child. Once they have determined that you are a good candidate for the procedure, they can begin planning your treatment. For your comfort, the treatment area will be numbed prior to the procedure. Depending on the severity of the case, our doctors can use either a laser or a small blade to reduce the tissue. Following the outpatient surgery, patients are advised to eat soft foods diet for approximately one week or until they are fully healed. Generally, normal activities can be resumed within two weeks. At Oral Surgical Associates, our doctors can perform a frenectomy on both young children and adults to correct a variety of cosmetic of functional issues. A frenectomy can have both cosmetic and functional benefits for patients. A labial frenectomy can alleviate pain caused by receding gums as well as improve your facial appearance by reducing the gap between your front teeth. In turn, this could improve your sense of confidence as well as the function of your bite. Similarly, a lingual frenectomy can improve your ability to eat and speak with confidence. Because patients will no longer be limited in the types of food they consume, another benefit is that patients can enjoy a more nutritious and varied diet. To learn more about the frenectomy procedure or to speak with a member of our staff about any questions you may have, contact our office online. You can also call Oral Surgical Associates at (406) 728-6840 to schedule your consultation. Oral Surgical Associates is Missoula’s oldest and most trusted oral surgery office. We have been providing excellent care to the Missoula and surrounding areas for over 40 years. (406) 728-6840 Call us anytime!